Vehicle Strategy: CSUN’s range-extending, parallel hybrid electric conversion integrated a water cooled, 53 kW DC brushless electric motor with a 63 KW, 1. Liter water cooled 4-cyclinder, 4-stroke, 4-valuve per cylinder internal combustion engine on a common shaft. The combined torque to the front wheel drive passed through an 8.21:1 single speed reduction. A .78:1 overdrive allowed for higher vehicle top speed and reduced engine noise at 70 MPH highway cruise. An electrically heated catalyst combined with closed-loop stoichiometric control limited exhaust emissions. The control strategy provided EV-only urban drive, subject to minimum battery state of charge, with hybrid drive at highway speeds. In hybrid mode, the motor became a generator and simultaneously recharged the lead acid battery pack. The configuration was designed to meet California ZEV requirements. 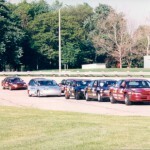 Vehicle Strategy: The team’s vehicle is a parallel hybrid with ZEV capabilities. The vehicle employs an automotive clutch to allow the Volkswagen TDI diesel to be removed from the drivetrain. This allowed the option to operate on the Solectria electric motor only. The motor and controller were not only used for propulsion, but for stopping torque using the regenerative capabilities of the system. All accessories usually powered by the engine were then powered by the auxiliary motors. Vehicle Strategy: The team selected a parallel drive hybrid electric vehicle as the vehicle architecture. The Propulsion was provided by a direct injected, turbocharged diesel engine that operated in parallel with a permanent magnet DC electric motor. The amount of motor assist was modulated in order to operate the engine in its optimum efficiency range. Electric energy storage was provided from nickel metal hydride batteries. Vehicle Strategy: The vehicle was a charge-sustaining hybrid with a powertrain of a two-stroke engine with a permanent magnet alternator attached to the crankshaft. The direct injection 500 cc engine ran on reformulated gasoline and power was stored in the 26 lead acid batteries linked in a series, which contained 330 V of power. A DC brushless traction motor capable of 66 kW coupled to an 8:1 one-speed transaxle completed the drivetrain. 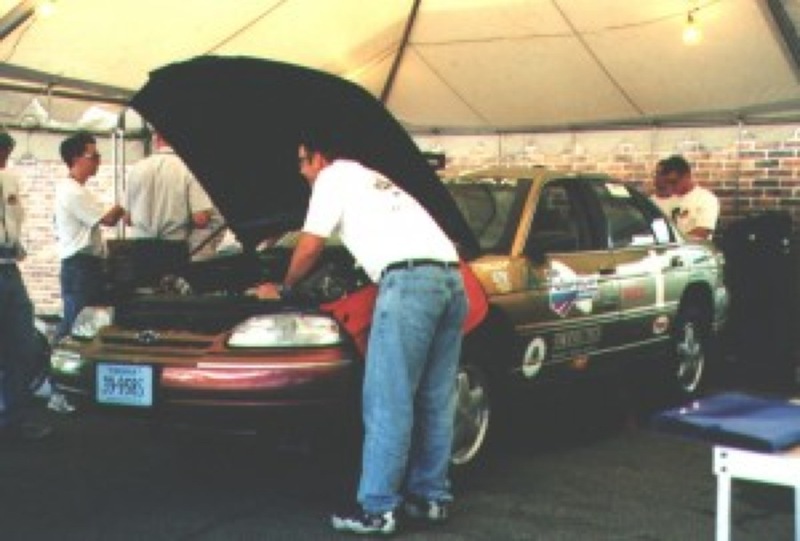 In the later years of the competition, the team utilized a 1.5L Peugeot diesel engine that was controlled via a true load leveling strategy of alternator power electronics. 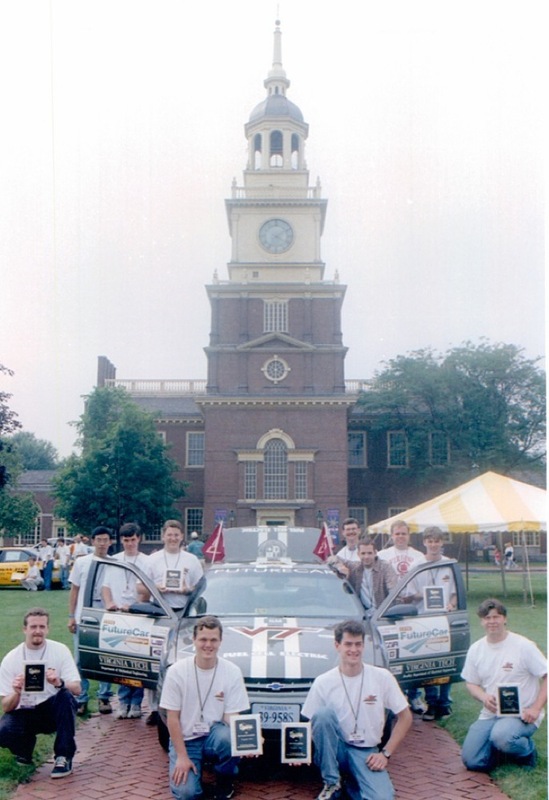 Vehicle Strategy: The Ohio State vehicle was a parallel hybrid with bias placed on the IC engine. A smaller electric motor and battery pack were used as part of a scheme to reduce idling losses, provide load-leveling, and recoup a measure of braking energy while adding little mass. The configuration ensured the vehicle remained fully operable in case of an electric malfunction. Vehicle Strategy: The vehicle platform demonstrated the latest fuel cell and automotive technology. The vehicle featured a proton-exchange-membrane fuel cell, flat transformer-based power converters, and a custom-built, dual-motor powertrain. With consumer satisfaction in mind, an emphasis was placed on comfort, driver-friendly operation, and performance. The vehicle also offered 210 ft-lbs of neck-wrenching torque and a stout 195 hp engine. 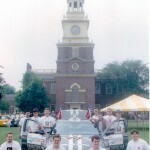 Vehicle Strategy: The team’s vehicle was a charge-depletion, parallel hybrid electric vehicle. This style of hybrid was chosen to optimize energy efficiency and minimize emissions. A Unique Mobility permanent mange, brushless DC motor and Honda Today 660 cc engine using reformulated gasoline are mechanically coupled to a Honda Civic 5-speed manual transmission. The powertrain configuration had 1/3 of the rotating components of a conventional vehicle and eliminated all typical engine accessory loads. A 15.4 kWhr Ovonic NiMH battery pack powered the motor and all vehicle accessories. The battery pack gave the vehicle a 100 km all-electric driving range. As an HEV, the charge-depletion control strategy minimized energy conversion losses associated to on-board electrical power generation. Battery state of charge (SOC) depleted over a typical driving schedule and was only replenished by charging from the utility grid or regenerative braking. A microcontroller monitored vehicle speed and SOC to manage electric motor and engine operation. At high battery SOC, the engine turn-on speed began at approximately 50 kph and decreased with decreasing SOC. With this strategy, the vehicle had a city and highway estimated driving range of 400 km on one battery charge. Vehicle Strategy: The vehicle utilizes an air injection system in conjunction with compressed natural gas. The air injection, or super-boosting system, works somewhat like a supercharger. Two small belt-driven compressors stored air in a tank and allowed it to cool during times of low average power and braking. The air and additional fuel was then injected into the engine under high load, which gave a higher peak power without the extra weight of batteries, motors, and drag of the compressors. Vehicle Strategy: The series hybrid electric vehicle featured an auxiliary power unit (APU) that tracked the power use of the motor and optimized the amount of power generated for the best possible engine, generator, and battery storage. The APU was powered by a small diesel engine that ran on biodiesel. 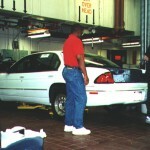 To further increase vehicle efficiency, the coefficient of drag was reduced by smoothing the front and rear shapes and adding a belly pan to decrease the amount of turbulence under the car. Vehicle Strategy: The team’s vehicle was a charge-sustaining, series hybrid electric vehicle with passive vehicle controls. Power to the 75kW traction motor was supplied by a 324V lead-tin battery pack. 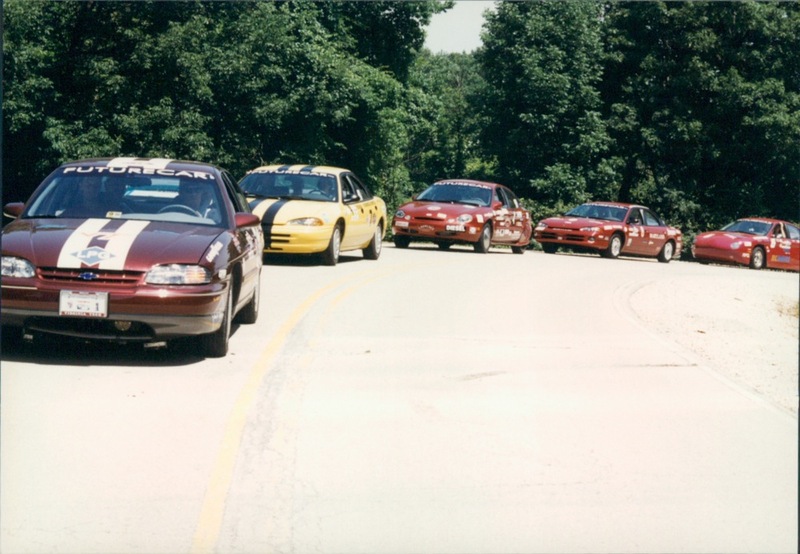 When the batteries reached a low state-of-charge, the ethanol-fueled 1L Geo engine turned on and ran at its most efficient point, producing the required traction power and recharging the battery pack when excess power was available. Other optimized features included the fuel tank, battery pack cooling system, composite hood and trunk, aluminum subframe, Sanden high-voltage air conditioning, custom-made Walker exhaust, exhaust gas recirculation, three-way controlled catalyst, heat battery, and additional lightweight components. Vehicle Strategy: The team used a parallel hybrid configuration with a Fisher electric motor and a Volkswagen 1.9L TDI diesel engine. Safe NiCad batteries were used for power storage and many weight reduction and aerodynamic techniques were implemented. The team also incorporated an exhaust heat recovery system and a heat battery into the vehicle. Vehicle Strategy: The vehicle designed was a dual hybrid that was capable of operating as both parallel and series hybrid. 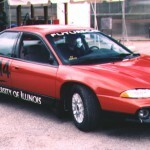 The vehicle used a compressed natural gas Saturn 1.9L engine with a Miller combustion cycle as an auxiliary power unit. The battery pack consisted of 28 Hawker Genesis 13-amp hour lead acid batteries (336 V nominal). The primary tractive power was provided by a Unique Mobility permanent magnet brushless DC motor with a smaller motor of similar design acting as a generator. The controls system intelligently selected the vehicle mode of operation and controlled the driving components. 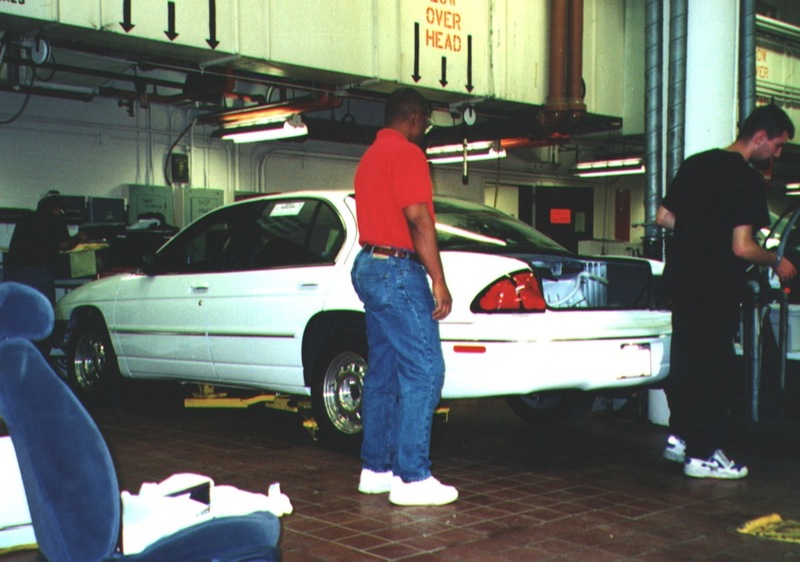 In addition to operating as a charge-sustaining vehicle, the low-rolling resistance tires were utilized to decrease the force opposing vehicle motion, which increased fuel efficiency. The most significant feature of the vehicle was the implementation of a power-split-gear reduction device that allowed a fixed ration of traction motor to wheel speed, while allowing the engine to operate at a constant speed with a continuous variable ratio to the wheel. Vehicle Strategy: The diesel-electric, parallel hybrid electric vehicle included a charge sustaining, load-leveling, electric assist control strategy. The team integrated a turbo direct injected diesel with an appropriately sized electric motor in a parallel configuration. The two power sources were controlled via an onboard computer to create a transparent vehicle operation that provided effective regenerative braking. Vehicle Strategy: The team designed a series hybrid electric vehicle that featured an AC induction motor with an IGBT inverter, which was used to drive the front wheels of the vehicle through a differential. A battery pack, located under the rear seat, provided the transient power for the electric drivetrain and storage capacity for the regenerative braking. A 3-cylinder, spark-ignited, internal combustion engine, which was fueled by propane, was coupled to an alternator which produced electricity to either recharge the batteries or power the electric drivetrain. All engine functions were microprocessor-controlled and the engine operated in a narrow speed and load range, which allowed for precise tuning for low emission and high efficiency. Later in the competition, 20-kW proton-exchange membrane fuel cell stacks fueled by hydrogen were added. Other fuel cell systems added included air compression and humidification, stack cooling water loops, output power processing, and controls. The vehicle was charge-sustaining with the fuel cell system. Vehicle Strategy: The team designed a series hybrid electric vehicle with a Unique Mobility SR180 DC brushless electric drive motor that draws power from a 180 V battery pack containing 15 12-V Hawker Genesis PbAcid batteries. A 1.9L 4-cylinder Saturn DOHC spark ignited engine converted to operate on compressed natural gas provided mechanical power input to the motor based alternator. The engine was optimized for high thermal efficiency and low exhaust emissions, while the unthrottled approach provided power for the drive motor with excess power going to recharge the batteries. Accessory losses were reduced by using more efficient, state-of-the-art electric units. 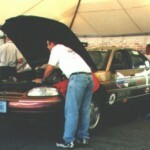 Later in the competition, the team transformed a Sable sedan into a compressed natural gas electric parallel hybrid electric vehicle. 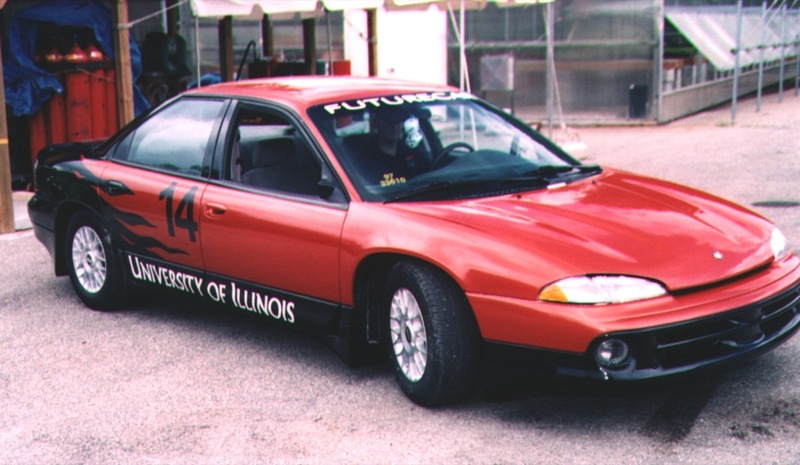 It [FutureCar] was different from Solar Car and Formula SAE in that it had real potential to get into production in the near future. This was interesting to me. The systems we worked on, the software we wrote, the team we developed – they all helped to expand my expertise in the technologies we were working on. I think it’s a really great way for students to be able to launch their careers in engineering and technology and in management. Some of the most successful engineers I know combine a technical background with the ability to work with their hands in the field, and AVTCs teach this. …there will soon be a place in the market for hybrid electric vehicles, and the students who are participating in these competitions are going to be the automotive engineers and designers who will make it happen. I still deeply enjoy my work and most days even look forward to getting up in the morning. I love being in the lab, I love working with my hands and I’m eager to learn something new. These are all passions that I attribute to my involvement with AVTCs. This year’s FutureCar Challenge offered a fantastic opportunity to see working fuel cells, hybrid electric powertrains, and other exciting technologies in popular real-world cars. 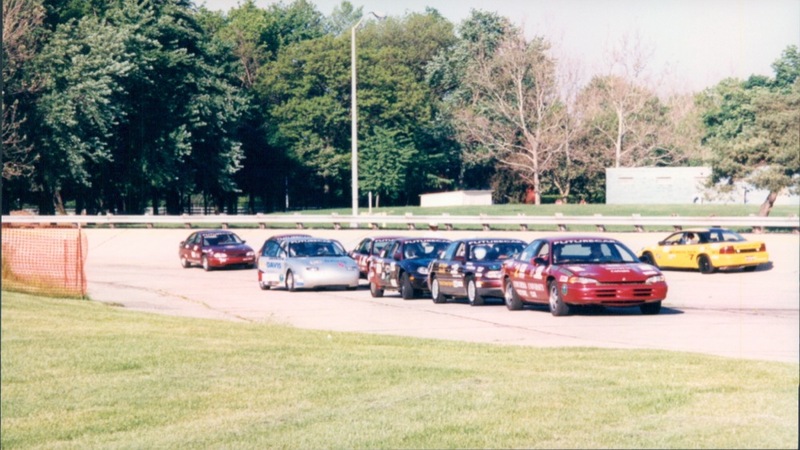 Teamwork, leadership, and communication are but a few of the very important skills that I developed during my years participating in advanced vehicle technology competitions (AVTC). You don’t know car until you’ve built, broken, rebuilt, rebroken, rebuilt, and finally put them together again – just in time. Working with a large group of students, professors, and companies is an excellent real-life experience.